30,000 traffic cops breathe better while keeping us safe. 70,000 Hawa Badlo warriors created. When Stars came together for a better tomorrow. HAWA BADLO is an independent people’s movement started more than two years ago, spearheaded by Social Cloud Ventures its aiming to change the air quality level with collective societal efforts. The initiative is supported by GAIL (INDIA) LIMITED. It’s a social movement targeting the digital Indian with humorous, eye opening and factual stories and social experiments aimed at propagating sustainable mind-set change at individual level, which collectively establishes an extensive community change for greener and cleaner tomorrow for us and generations to come. After three years of creating awareness and sensitizing the people about Air pollution, Hawa Badlo 2.0 is about coming together and declare war on the menace of pollution, and in this war ‘Seed Bombs’ are going to be our weapon. Natural Gas is the cleanest-burning hydrocarbon as it emits very less amount of greenhouse gases and is the fuel of a greener future. Be a crusader in the fight against the menace of Air-Pollution by becoming a Hawa Badlo Warrior and pledging for a pollution free earth. Be a part of the revolution where every soul and voice matters. Come and join us to create a better future with your own hands. Air Pollution is an Invisible Killer. Every 23 seconds an Indian dies because of Air Pollution.Let’s come come together on a single platform to protect human health and country from the ill effects of Air Pollution. Honourable Minister of Petroleum & Natural Gas and Skill Development & Entrepreneurship, Government of India. 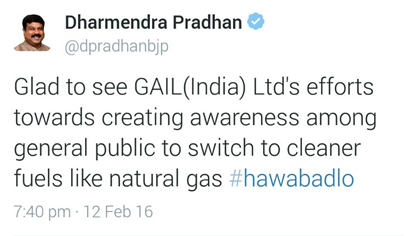 "Glad to see GAIL (India) Ltd's efforts towards creating awareness among general public to switch to cleaner fuels like natural gas #hawabadlo"
According to the World Health Organisation (WHO) global air pollution database released in Geneva, India has 14 out of 15 most polluted cities in the world in terms of PM 2.5 concentrations.